Now you can Update Xperia XZ to Android 8.0 Oreo by installing the latest 41.3.A.0.401 Oreo Firmware. A few week after Xperia XZ Premium, Sony starts rolling out the latest Android 8.0 Oreo update for Xperia XZ. The update brings all Oreo Features along with Xperia Action and Reminders feature. 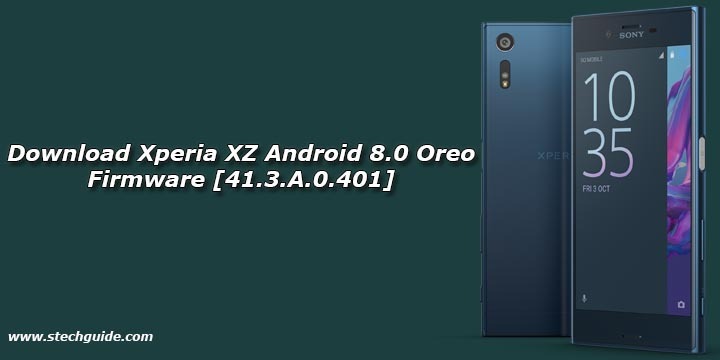 Latest Xperia XZ 41.3.A.0.401 Oreo Firmware is also available for download. Now you can wait for the OTA or Download Xperia XZ Android 8.0 Oreo Firmware from below to update Xperia XZ to Android 8.0 Oreo manually. Here we share the latest Xperia XZ Android 8.0 Oreo FTF Firmware with that you can update your device manually. If you want to install 41.3.A.0.401 Oreo update on Xperia XZ then you are in right place here we provide you the Official Xperia XZ Android 8.0 Oreo Firmware. Download Xperia XZ 41.3.A.0.401 Oreo FTF file from below. You can manually check the Xperia XZ 41.3.A.0.401 Oreo update by going to Settings -> About Phone -> Software Updates. If you won’t find the update there you can download the Android 8.0 Oreo firmware for Xperia XZ from below and update it manually. Download Xperia XZ Android 8.0 Oreo Firmware from below. This Firmware file is only for Xperia XZ. Don’t try this on any other device. Now Download Oreo 8.0 ftf File for Xperia XZ from above and save it on Flashtool>Firmwares folder. Once the installation completes, leave the Volume Down key and boot your phone normally. You should now be on the latest Android Oreo firmware.